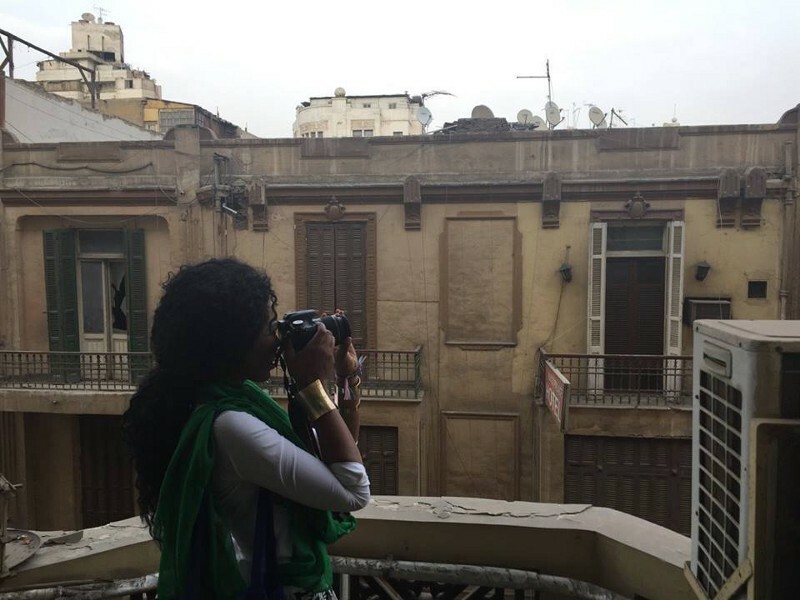 About a month ago, I was up on a balcony marveling at Egyptian architecture from the fourth-story of a downtown building in the country’s centuries-old capitol. 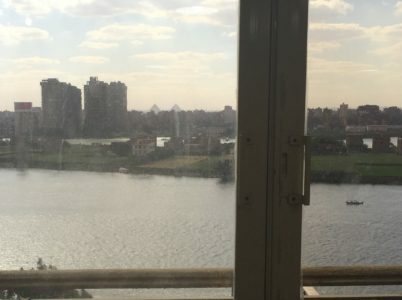 Sean McMinn, Data reporter for CQRollCall, was invited to travel to Egypt with the Professional Fellows Program and writes about his recent experience. Legacy International has been administering Professional Fellows Program since 2009, and is funded with grants from the U.S. Department of State. Ten minutes later, I found myself locked in a bathroom where the deadbolt was stuck, legitimately wondering if my life was going to depend on my ability to break down a heavy wooden door. After swallowing my pride, I banged on it and got helped from a confused, probably annoyed, Egyptian. Welcome to the Middle East, where contrasts show themselves in the most unexpected ways. The balcony I was standing on right before nature called. Egypt is quite a place to start with, for your first trip out of the country. That’s what I kept hearing as I told friends I was heading there for a State Department-funded program last month. They were, of course, right. 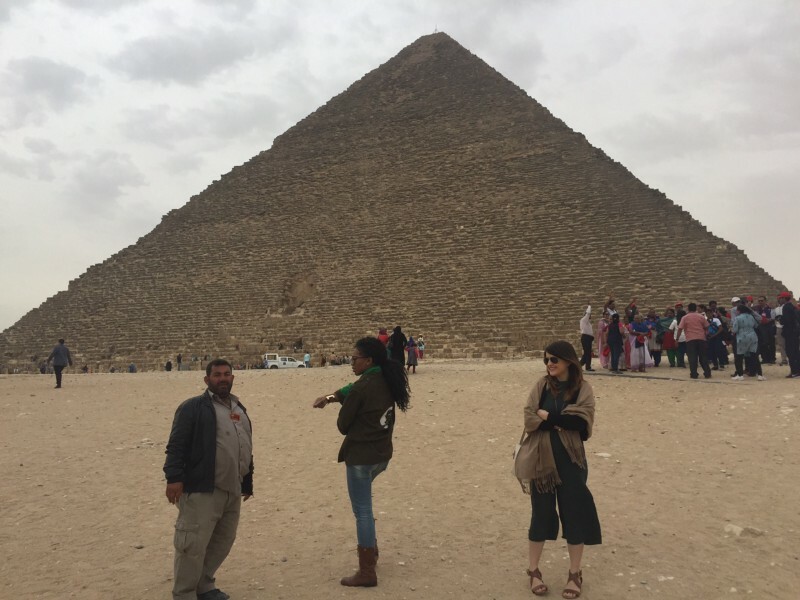 When you’re somewhere a 4,000-year-old sphinx and pyramids are the most familiar sights you’ll see, the culture shock isn’t a mild one. Donkey-pulled carts move side by side with Hyundais down the street, and it’s much easier to find crumbling buildings than clean ones (“clean,” I learned, is also a completely relative term). Police harassment — and worse — is a daily reality for Egyptians (and for us Americans, despite the country’s huge reliance on its tourism economy). Because you’re so focused on these cultural differences, the contrasts start to stand out in a way they don’t in the U.S. Luxury hotels for westerners tower directly over slums where the median income is less than the poorest area of D.C.. And in an instance that stuck in my mind for some reason, a well-known restaurant we went to had a shattered stained glass window embedded directly over our table. It seemed either no one noticed the glass had a hole in it, or no one had bothered to replace it. Still, there are so many bright spots among the grey and brown crumbling, sometimes slanted, buildings that line almost every street in Cairo. We met an artist who could have his own studio in New York or Paris, but wants to stay and help his impoverished neighborhood. I presented to a group of journalists who risk imprisonment as they publish news that’s critical of the government, under their real bylines. 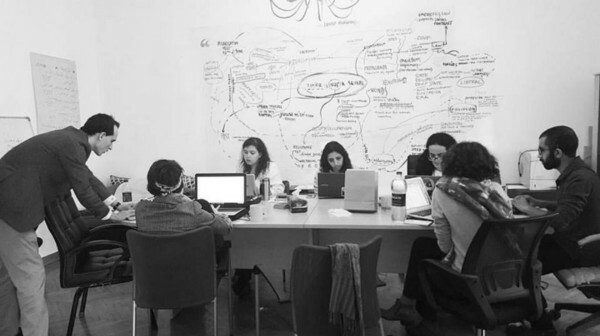 We went to a festival that brought Egyptians from a remote area of the country to the capitol, and we bought handmade goods from women who had received mini-entrepreneurship lessons from the event’s organizers. But over all those bright spots hung the government, which felt like a particularly dark shadow that followed us almost everywhere we went. Looking back, there were actually relatively few times in Cairo when we could be completely carefree and talk openly with each other. Sure, part of that was probably because of my inexperience traveling, and my mild paranoia as a journalist. But the force of the government was always on display. On a drive to get breakfast, for instance, we saw 18-year-old police officers, helmets askew, equipped with AK-47s. Some had their weapons slung around their necks, and one sat spread-eagle with his rifle pointing straight toward his crotch. One of our local hosts explained that they were guarding a foreign embassy, which can be one of the most boring assignments in the city. A few seconds later, I saw another one texting on his phone as his weapon dangled. And at a workshop for entrepreneurs we hosted (a few minutes after the bathroom incident), a man sitting near the back of the room struck me as a little suspicious. It turned out one of our hosts thought the same thing, since the Egyptian government routinely sends spies to events where Americans are speaking, she said. She told me he was probably there to make sure we didn’t say anything at odds with the president’s … interpretive … brand of democracy. But because we were there on a U.S.-sponsored trip to spread the (admittedly vague) concept of “civil society” in the region, that’s exactly what we were doing. We were also asked to keep a low profile in the country, which made these incidents especially concerning to us. Sometimes that meant taking small precautions, like not talking too loud in a restaurant about our thoughts on democracy, or taking on European accents when we were at the pyramids so we wouldn’t get the “special” security treatment reserved for Americans. “Where you from?” an official tour guide at the pyramids asked me after taking our picture. “Britain,” I said, channelling all my years of Harry Potter watching into a fake accent. “Oh, from Edinburgh?” he asked. Realizing I knew next to nothing about British geography, I decided I’d be from Canada if anyone else asked. Our curious tour guide, on the left, with two of my traveling partners. But there were bigger threats we saw from the government, too: A friend of one of our hosts had been imprisoned for months after making a joke about bombs on a private messaging app. A writer for the newspaper I met with had been jailed for his work investigating a secret military trial of potential revolutionaries. The country’s been in constant conflict for decades, and it shows. There was optimism, I’m told, when Egyptians removed Hosni Mubarak during the 2011 revolution and replaced him with Mohamed Morsi of the Muslim Brotherhood. From my conversations in Cairo, it doesn’t appear to me that people wanted a fundamentalist Islamist state, but they trusted the Brotherhood to ease tensions over police brutality and the Mubarak government’s heavy-handed approach. Soon after, the people came to be disillusioned with Morsi. Protests began and, once again, the military took control of the country. Fearful of another revolution, current President Abdel Fattah el-Sisi took a dictatorial approach to human rights, jailing political opponents and using force to discourage civil discourse. Just this week, dozens were arrested while protesting, which is illegal in Egypt. That’s why we were there. 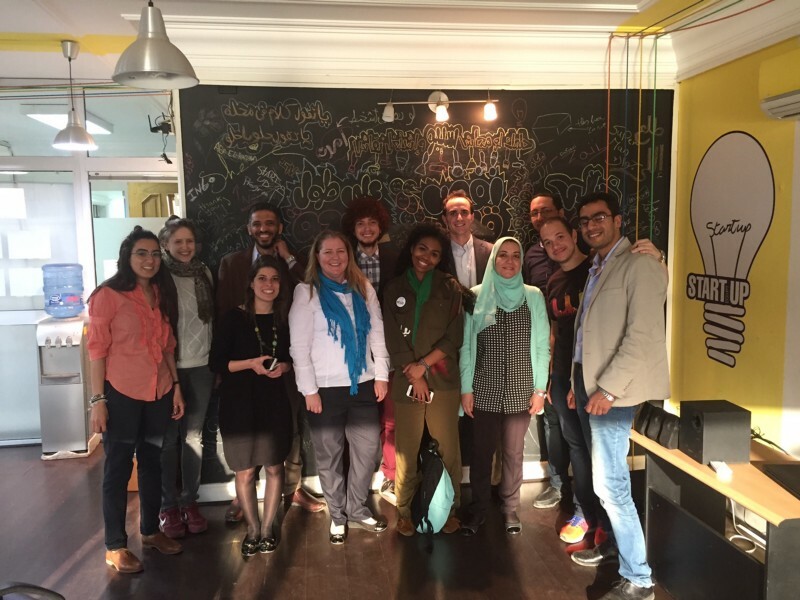 The State Department funds a professional exchange program between Egyptians and Americans, in what our liaisons in the government called “people-to-people diplomacy.” Last year, a friend asked me to host an entrepreneur in the program coming to the United States, and I applied to be part of the American delegation in Egypt to teach data visualization to groups we met there. Of course, I learned so much more than I ended up teaching. And I’ll readily admit that — even with the borderline rude number of questions I asked our hosts — a week there wasn’t nearly enough time to understand the intricacies of their country. But I’m also not exactly sure how to quantify the amount that our “people-to-people diplomacy” helped. There are so many issues worth tackling in the region, and the way that some State officials talked about the program, you’d think this type of diplomacy was going to solve all of them — even terrorism, according to this media release. In our pre-departure orientation, the officials told us that even just meeting Americans can help prevent potential extremists from moving toward jihad. To the U.S.’s credit, we were never asked to embellish the truth about living in America or help spread propaganda in the majority Muslim country, but the clear implication was that any positives we could show Egyptians about the United States could help our goals in the region. So did I stop a would-be ISIS militant there? Probably not. It’s hard to say if we even left a positive impression of the United States, since we were about 100 times more interested in learning about their way of life than trying to spread our own. The State Department is readily willing to invest in this kind of program, though, so there must be something they get out of it. For the sake of full disclosure, I feel like I should say here that we had all our expenses covered — that included flights, a room at the five-star Safir Hotel, most meals and $400 in spending money. And yes, I’m well aware I’ve peaked when it comes to traveling internationally on a budget. But I like to think that even though we didn’t see the immediate effects of our work there, we as a group contributed to empowering Egyptians. As we presented to different groups about the work we do in Washington, I hope we weren’t just passing on lessons on how to design charts, in my case, or how to plan a community event, in the case of one of my colleagues. I hope we helped encourage people there to tackle ambitious, significant projects, despite the challenges that come with working in a country whose government seems like it’s constantly about to fall off the edge. And, really, I think the people there can do that. I was struck by how much the Egyptians we met loved their country. Despite all the wrong their government has done to them, they seemed passionate about making Egypt a better place, because they were able to mentally separate their country from its corrupt leaders. That’s something I hadn’t put much thought into before. America, to me, is as much the White House, Capitol and Supreme Court as it is a place on the map. If — cue the political jokes here — the White House fell to corruption, the judiciary did nothing to stop it and Congress played right into the hands of a dictatorial president, I’m not sure how much I’d really love my country anymore. But Egypt, I sensed, wasn’t to its people just a set of ministries and military leaders. It was a community of nationals. It was a bold history. And, they hope, it will carry a bold future, too.